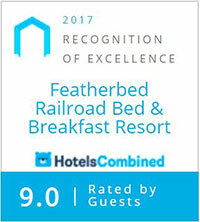 The award-winning Featherbed Railroad Bed and Breakfast Resort in Northern California's wine country offers a truly unique lodging experience. The Featherbed Railroad is located right on the shore of Clear Lake in Northern California's Lake County. Come join us and see what we are talking about. We continue to get attention and have been called One of the Most Unusual Hotels in the World. At the Featherbed Railroad, our guest rooms are in one of nine theme-decorated vintage railroad cabooses set in a park-like setting overlooking our private boat launch, beach and pier and all our rooms feature Downlite genuine goose down featherbeds. A truly unique experience for those looking for a hotel, motel or other lodging. 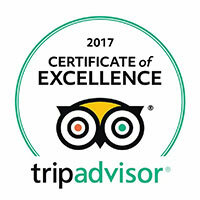 TripAdvisor awarded us in the top 10% of hotels worldwide for customer experience two years in a row. We were also recently featured once again as the #1 place to sleep with a ghost. Yikes! We were also called one of the 10 Wackiest Hotels by the publishers of Hotels.com. We have also been featured on TV's Eye on the Bay. 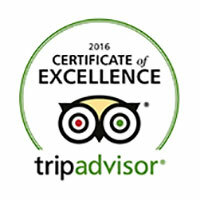 We have also been awarded a Certificate of Excellence by TripAdvisor. Next time you stop at a traffic signal and wait and wait, or sit in traffic, or get that annoying phone call about your vehicle's warranty or just deal with too much of the city, maybe it's time for a dose of Lake County. With our unhurried lifestyle, huge natural lake, rural surroundings, friendly people, terrific wines and abundance of natural beauty a dose of Lake County might be the perfect thing to relieve some stress. There's always something happening here - check our events calendar today. © 2019. All Rights Reserved. Featherbed Railroad.